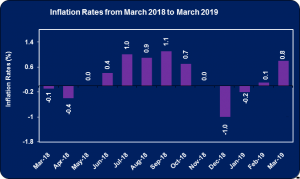 The consumer price index for the month of March 2019 recorded an inflation rate of 0.8%, following a 0.1% increase in its index for February 2019, according to The Statistical Institute of Jamaica (STATIN). The Consumer Price Index for the month of March rose to 256.5, relative to the 254.3 reported for February 2019. This movement was largely attributed to the upward movements in the divisions, ‘Food and Non-Alcoholic Beverages’ by 0.9% and ‘Housing, Water, Electricity, Gas and Other Fuels’ by 1.5%. The ‘Transport’ division also contributed to March’s inflation with an increase of 1.1% in its index. Inflation within the Greater Kingston Metropolitan Area and Other Urban Centres both increased by 1.0% while Rural Areas advanced by 0.6%. The index for the ‘Food and Non-Alcoholic Beverages’ division recorded a 0.9% increase in its index for March 2019, following a 0.7% increase for February 2019. This resulted from the upward movements within the groups ‘Food’ and ‘Non-Alcoholic Beverages’ by 1.0% and 0.2% respectively. Within the ‘Food’ group, the class ‘Vegetables’ increased 4.1% as a result of “higher prices for produce such as sweet pepper, cabbage, carrot” while the class ‘Starchy Foods’ fell by 0.8%. The ‘Non-Alcoholic Beverages’ group registered a 0.2% growth in its index, as the groups ‘Coffee, Tea and Cocoa’ and ‘Mineral Water, Soft drinks, Fruits and Vegetable Juices’ recorded increases of 0.3 and 0.2% respectively%. The divisions ‘Alcoholic Beverages’ and ‘Clothing and Footwear’ recorded increases of 0.5% and 0.4% in their respective index for March 2019. The increase within the division ‘Alcoholic Beverages’ “was mainly as a result of the upward movements in the price for stout and beers” while the increase in the division ‘Clothing and Footwear’ was as a result of the two groups ‘Clothing and Footwear’ recording increases of 0.4% and 0.5% respectively. The division ‘Furnishings, Household Equipment & Routine Household Maintenance’ recorded an increase of 0.2% for March 2019. The increase within the division was attributable to the group ‘Goods and Services for Routine Household Maintenance’ increasing by 0.1%. According to STATIN, this resulted from “increased prices for some household durables.” The group ‘Furniture and Furnishings’ and ‘Household Appliances’ also contributed to the upward movement with increases of 0.4%. The divisions ‘Health’ and ‘Recreation and Culture’ both recorded increases of 0.1% for March 2019. The increase within the division ‘Health’ resulted from an increase of 0.1% within the groups ‘Medical Products, Appliances and Equipment’ and ‘Health Services’. The upward movement in the division ‘Recreation and Culture’ was mainly influenced by “the increase in the cost for ‘Information processing equipment’ and ‘Equipment for sport, camping and open-air recreation’. Lastly, the divisions ‘Restaurant and Accommodation Services’ and ‘Miscellaneous Goods and Services’ each recorded an increase of 0.3% in its index for March 2019. The movement in the former was attributable to an increase in the “prices for alcoholic beverages” while the latter resulted from “increased prices for some personal care items and the increase in administrative fees associated with insurance services”. Notably, the other divisions ‘Education’ and ‘Communication’ had no effect on the index for March 2019.